HCM CITY Workers from the social work division of the District 2 Hospital in HCM City meet every outpatient and inpatient to find out what problems they face and provide quick assistance. Then they share their problems and say what help they need to, he said. Đào Xuân Bình, one of his staff, said comforting and explaining when a patient has a problem could help them understand the medical workers are trying to provide the best service they can. At public hospitals the social workers are “the bridge” between doctors and patients and help improve patients’ satisfaction with hospitals’ service quality, reducing conflicts between them and medical staff, he said. In many cases, patients and their relatives need to be told clearly about administrative and health insurance procedures, especially when they are hospitalised for emergency treatment, he said. In the three years since its establishment the division has grown to 22 staff divided into teams to carry out various activities such as conducting surveys on patient satisfaction, raising funds for patients with financial difficulties, organising charity trips to remote areas, and others. Lê Minh Hiển, head of the social work division at Chợ Rẫy Hospital, said his staff are present in “each place” at the hospital to guide patients. “Social work brings happiness in our life and makes us feel useful because we can bring joy, hope and satisfaction to patients, especially ones with financial difficulties, and their relatives. Châu said many patients have great financial difficulty, especially those in his hospital’s intensive care unit (ICU). L.M.T, a road accident victim with severe injuries, for example, was treated at the ICU for four months, and the cost came to nearly VNĐ500 million (US$21,500). Ngô Văn Minh, Châu’s subordinate in charge of raising funds, said his family could not afford the money, and the social division had to raise the funds from many sources, including on the media. Hiển of Chợ Rẫy said his division has raised dozens of billions of đồng to help poor patients. 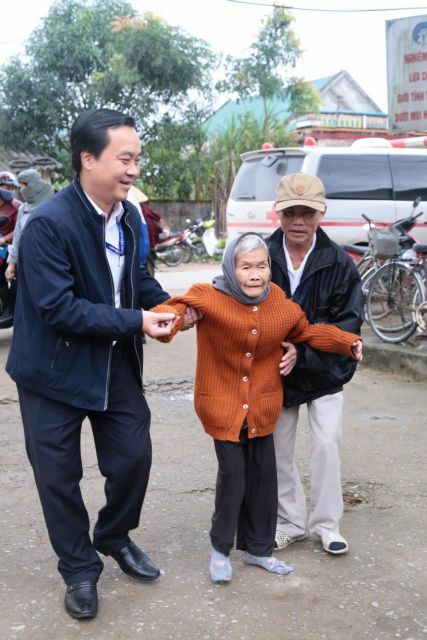 A patient from the south-central coastal province of Bình Thuận was one of patients the division assisted. Because she contracted final stage heart failure, she had to have a heart transplant but had only VNĐ15 million while the cost of the surgery and treatment was nearly VNĐ200 million. “The donation saved not only patient but also the entire family,” Hiển said. Patients and their relatives also are provided with free food every day, Hiển said, adding that more than 4,000 meals are provided in three shifts daily.